Next year we will be getting Benedict Cumberbatch as Dr. Stephen Strange and people are going to say some stupid things. Like, "Wow! I never knew superheroes were into magic!" Or "Gee, Dr. Strange was the first magician-superhero!" Dr. Strange appeared for the first time in July 1963, (on newsstands in June) making him the same age as me, fifty-two. But not by a long stretch is he the first or the oldest "occult doctor" of comics. In 1935, while waiting to sell Superman to the comic strip syndicates, Jerry Siegel and Joe Shuster created other comics to sell to the fledgling comic books operated by Major Malcolm Wheeler-Nicholson. One of these included the first comic ghost-breaker, "Dr. Occult, Ghost Detective." 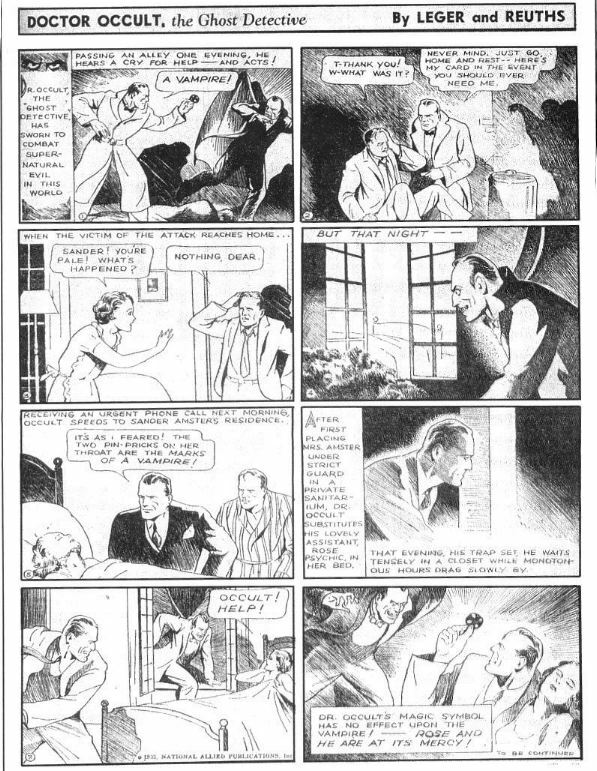 The credits for the strip were given to Legar and Reuths, Siegel and Shuster's pseudonyms as they had another strip, Henri Duval, appearing in the same comic under their real names. Dr. Occult appeared for the first time in New Fun Comics #6 (October 1935). The story is the opening act of a tale of a vampire who is terrorizing a young couple called the Amsters. Dr. Occult is accompanied by his faithful sidekick Rose Psychic. The strip was one page long in black-and-white at the back of the issue. Siegel and Shuster's Henri Duval got place of pride at the front of the comic. After this brief appearance, Dr. Occult went to the newly formed company, DC, and its continuation of New Fun under the name More Fun Comics. Dr. Richard Occult would be found in the pages until issue #32 (June 1938). But who were the predecessors to Dr. Occult? In fiction, the occult doctor dates back to at least 1872 and J Sheridan Le Fanu's Doctor Martin Hesselius, though Bram Stoker's Dr. Abraham van Helsing (1897) is far better known. The ghost detective genre was richly populated between 1898 and the pulps of the 1930s. The top occult doc in 1935 was Seabury Quinn's Jules de Grandin, appearing in Weird Tales. In the comic strips, Lee Falk created Mandrake the Magician in 1934. While Mandrake's powers are of hypnotism and not actual magic he was the first true superhero and set the bar for all characters who followed. Certainly Siegel and Shuster were aware of Mandrake's popularity in the newspaper comic strips, a market they themselves wanted for Superman. The tale of the Amsters and the Vampire Master continued in More Fun Comics #7-9 (January to March-April 1936). The Vampire Master hypnotizes Lois Amster, sending her to kill her husband. Fortunately, Dr. Occult and Rose are there to revive her. The heroes go in pursuit of the villain, but are trapped by the undead fiend in his lair. The Vampire Master uses his strange machinery to create a duplicate of Mrs. Amster that stabs him and tries to kill Lois. The vampire presses a button that saves her and the good guys flee as the lab burns down, with the villains succumbing to the flames. No stakes are driven through any hearts here. Superhero type story elements are more prevalent than Victorian castles. Issue #10-13 (May-September 1936) grew to two pages with plots seeing Dr. Occult and a Lieutenant Day chasing a mad doctor who calls himself Methusaleh. The name is apt, for he can steal the youth from others. In another storyline, Dr. Occult and a young girl are attacked by a werewolf. The monster proves to be a man named Westly, who asks Occult to cure him of his curse. In the process, Occult discovers an entire boarding house full of werewolves. Wheeler-Nicholson sold out and left comics, so the Dr. Occult character continued in Centaur's The Comics Magazine #1 (dated May 1936) with a name change to Dr. Mystic and the credits restored to "Jerome Siegel and Joe Shuster." In an issue dated May 1936 (though probably later) Dr. Mystic faces off against a new villain, Koth, and with a new feel. The storyline would continue in More Fun Comics #14-17 (October 1936-January 1937) with the villains planning to use a phantom army to take over the world. The look of the strip, with capes and swords, is more Buck Rogers than psychic detectives. 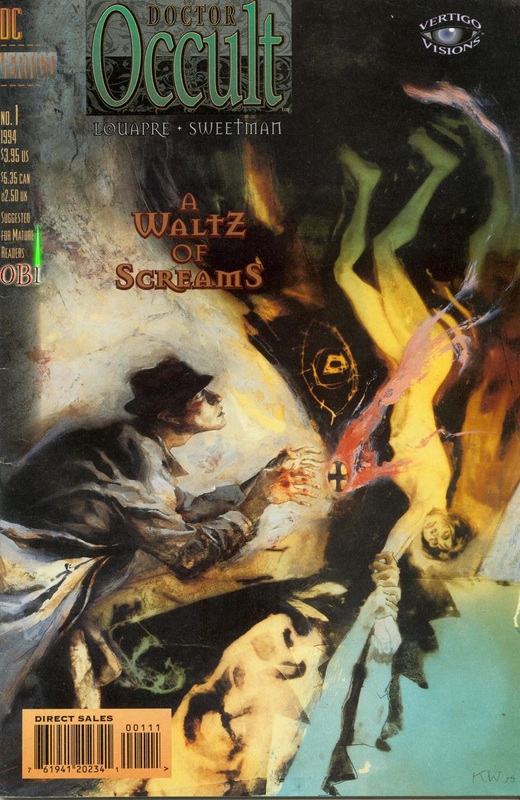 Issue #18 saw the return of the mystery-styled plot with "Ray of Life," where Doctor Occult encounters a dead body in a restaurant. The body - along with others - disappears for a terrible reason. 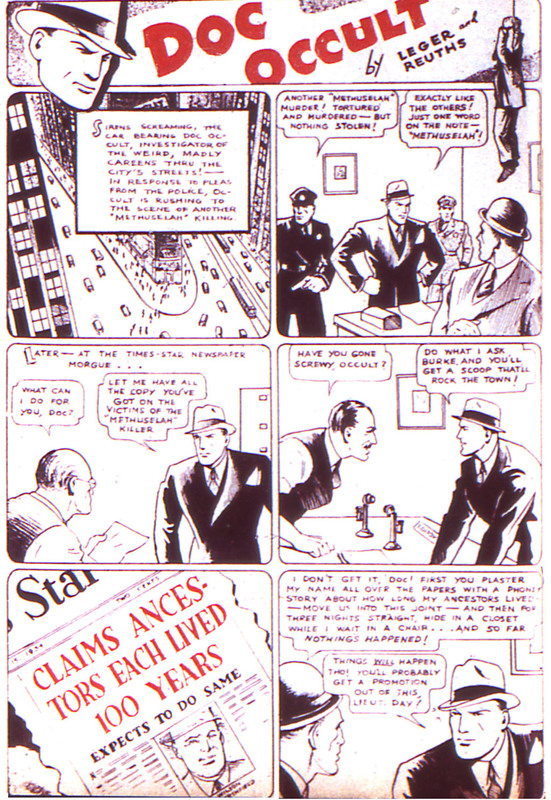 It is with Issue #22-32 (July 1937-June 1938) where we find the final version of the strip in place, now four pages in color. After the "Ray of Life" serial, Dr. Occult would have complete stories in one issue, and these most often at the front of the magazine where the most popular strips appeared. One of these is called "The Henri Duval Murders," a fun poke at their other strip, though not a team-up. What followed were people shrunk to doll size, snake worshippers, spectral killers, a possessed medium, and a corpse controller. 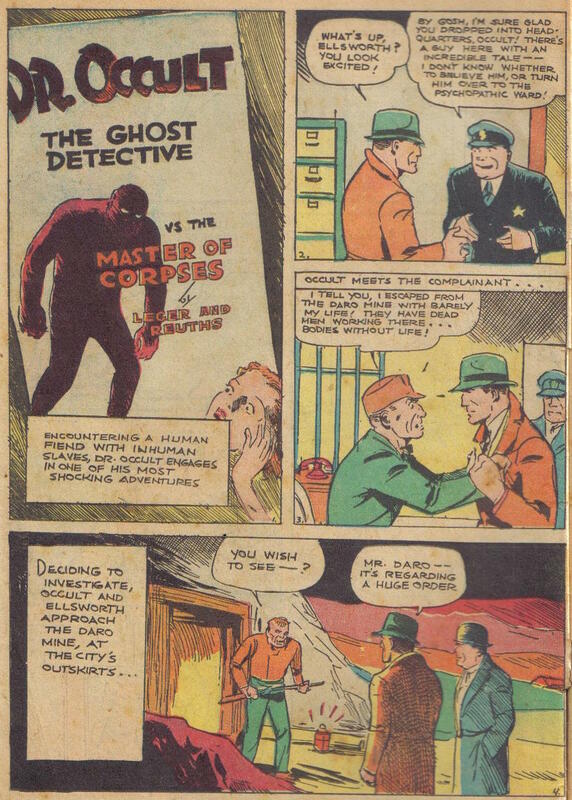 Issue #32 (June 1938) was Dr. Occult's final tale for forty-seven years. His next appearance was a guest spot in All-Star Squadron #49 (September 1985) written by Roy Thomas. Jerry Siegel wasn't quite done with magical characters after Dr. Occult. In January 1940 in More Fun Comics #51 he would create another classic DC character, The Spectre. With the lessons learned from Dr. Occult/Mystic, he blends horror and magic with crime fighting. Gardner F Fox and John Broome would complete the DC supernatural squad with Dr. Fate in More Fun Comics #55 (May 1950) and The Phantom Stranger in 1952. What influence did these DC characters have on future ghost detective comics? The impact is evident by the number of lame imitators in various comics such as Zero in Feature Comics (1940), Dr. Styx in Treasure Comics (1942), and Dr. Drew in Ranger Comics (1949), to name only three. Siegel and Shuster would reinvent the superhero with the release of Action Comics #1 (June 1938), but their contributions to weird characters would live on too, though not until 1963 and Marvel's Doctor Strange and 1967 DC's Deadman would new supernatural detectives be so abundant again.